Harriett Baldwin kicked off her re-election campaign in Pershore on Saturday morning (May 13), chatting with local shoppers on the High Street. The Westminster hopeful was joined by a team of supporters chatting to residents and making the case for a Conservative majority on June 8. Harriett commented: “It was great to chat to lots of local people and talk about the importance of the General Election to deliver a strong and stable Government for Theresa May. “Many people here are worried about the prospect of a coalition of chaos led by Jeremy Corbyn. “We’ve been getting the message out that we must ensure Theresa May gets a strong Conservative majority to give her the best possible mandate as we enter the Brexit negotiations. “I’ve worked hard over the last seven years and I am proud of the progress we have made towards securing the new Link Road, getting a better funding deal for local schools and helping Pershore High School to secure the funding for its new arts and humanities blocks. 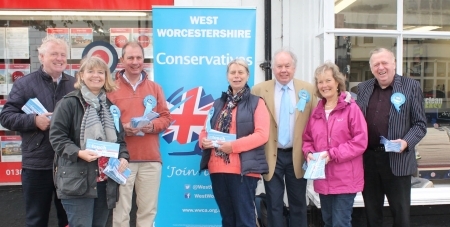 Photo: Conservative candidate for West Worcestershire, Harriett Baldwin is joined by supporters on Pershore High Street.